That is it from me for today. Thanks for your company and your interaction. It has been a pleasure. Marouane Fellaini will be the toast of Manchester - well the red half anyway. Coming off the bench for his first action of the season to head home what could prove a crucial third for United. So, from our earlier vote, 15.2% believe Manchester United are the most likely to challenge Barcelona and Real Madrid in the Champions League. Unsurprisingly, Bayern Munich have come out on top. Going on the stats below, Club Brugge can have few complaints at the defeat. Louis van Gaal has told the media Michael Carrick's half-time substitution was tactical. No injury there. Club Brugge manager Michel Preud'homme on BT Sport: "You have a small chance at home but it is going to be very difficult. I know Fellaini, of course, and he is very strong in that situation,. "We tried to play with our qualities, we missed a lot of players. The red card was very far for me, it is difficult to see. "If we have to miss our captain and central defender, with all our injured players, I don't see the solution to beat Manchester United." Manchester United manager Louis van Gaal on BT Sport: "It makes a difference because 2-1 is a very difficult result. We deserved much more because we created a lot of chances. It is what I am always saying, you have to be effective. We have a lot of chances and only three goals. "I am happy because of the last goal. We have practiced that before when we need Fellaini, we put him in the penalty area because he has that quality. "I am very happy for Memphis because a player needs that. I said it was a matter of time and hopefully he shall continue. He is 21 and he has only played two seasons for PSV, I have confidence in him. "It is not a simple opponent. It is still a game but, because of that last goal, it is more confident for us." Chris Fleming: United to qualify and then struggle in their Champions League table against considerably improved opposition. Will Louis van Gaal be happy with that? I'm sure he will be. Three matches played this season, three wins. Performances could undoubtedly be better but it is all about results. Manchester United goalscorer Marouane Fellaini speaking to BT Sport: "It's a fantastic win today and we have to be careful in Brugge but we have the quality to win there as well. We have to be ready." Memphis speaking to BT Sport: "It is really important we win the game. We created a lot of chances, I feel disappointed I could not finish the last two chances. We have to travel to Brugge and finish the job. Qualifying for the Champions League group stages is worth an awful lot of money to Manchester United and they will feel they are almost there. Club Brugge will be absolutely devastated to concede so late. C hris Harvey: Qualify for the Champions League and they automatically become one of the favourites. Definitely the Premier Leagues best hope. 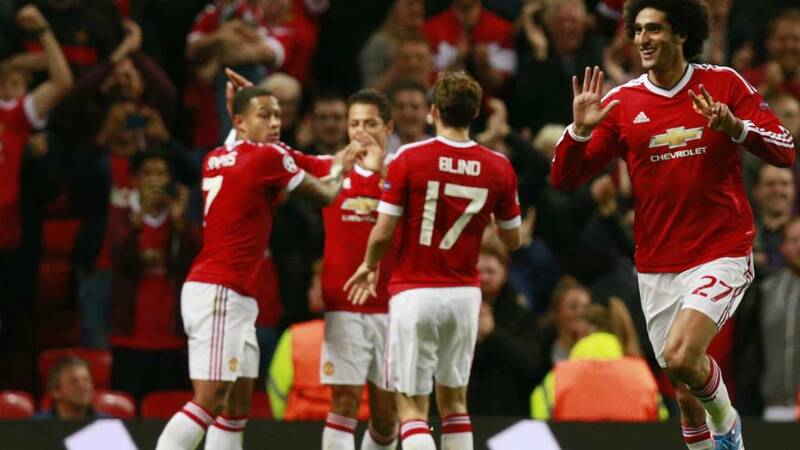 Job done for Louis van Gaal's men but it wasn't entirely convincing. Taking a 3-1 lead into the second leg in Belgium should be enough for United to reach the Champions League group stages though. And there it is. Massive, massive relief for Manchester United as Maraouane Fellaini nods in Memphis' delightful cross from the left. A real chance. Bastian Schweinsteiger heads the ball across goal and Chris Smalling should score. His free header from five yards is straight at the keeper. It is easy to forget Brugge are down to 10 men as United struggle to create anything at all. Last minute of injury time and a free kick 40 yards out. Three minutes of injury time is signalled. United will take the lead to Belgium but is 2-1 enough? Into the last minute and Manchester United can't break down Club Brugge. Corner for Manchester United. Can they? Nope, the ball is cleared. Club Brugge fans are getting the bird from the home supporters for their rendition of 'You'll Never Walk Alone'. Maraouane Fellaini heads harmlessly wide. Manchester United are pouring forward but not creating a great deal... The home fans are pretty quiet. Wayne Rooney has worked hard but he doesn't look composed in front of goal. Marouane Fellaini is brought on for his first appearance of the season for Manchester United. He replaces Wayne Rooney, who has been pretty quiet. 'Get the ball forward lads' will be the message. The visitors' final 10 minutes has just got more difficult. Centre backBrandon Mechelemistimes a tackle on Javier Hernandez and receives a second caution and his marching orders. United have 10 minutes to play against 10 men. Another United corner. Memphis swings the ball but Bastian Schweinsteiger is penalised for some pushing in the penalty area. Time is ticking and Club Brugge are holding on to what would be a tremendous result. Juan Mata combines with Javier Hernandez to try and inject a bit of life into United. The Mexican's cross is deflected and the ball ends up with Bastian Schweinsteiger, whose shot is deflected for a corner, which comes to nothing. Remember, as it stands, if Brugge beat United 1-0 in the second leg in Belgium they would be through. United could do with something special - and quick. Here comes Javier Hernandez for Manchester United. Adnan Januzaj is replaced and the Mexican gets a huge cheer - as does Januzaj, who started his first competitive match at Old Trafford since February. United need a goal. Into the final 20 minutes. Can United make the second leg a lot more comfortable? The longer this goes on at 2-1 to United, the nervier the hosts will get. Club Brugge will be more than happy at going into the second leg with just a one goal deficit. United will feel they should be home and hosed. What a chance for Memphis to complete his hat trick - and he fluffs it. Luke Shaw cross from the right, Wayne Rooney deftly flicks the ball on and Memphis looks like he must score. Somehow the Dutchman balloons the ball over the bar from eight yards. Horrible. Quote Message: I think Manchester United keeper Sergio Romero stayed down until his face stopped turning red. I think Manchester United keeper Sergio Romero stayed down until his face stopped turning red. What is Sergio Romero doing there? Matteo Darmian's back pass seemed harmless enough but the United goalkeeper dallied and dallied and striker Obbi Oulare almost stole in to steal the ball. The keeper is awarded a free-kick, fortunately for him. Approaching the final half an hour and United will know they could do with a couple more goals here. Wayne Rooney tries to oblige but he flashes a shot well, well, over the bar from 20 yards. United are about to come up against a different type of threat. Striker Obbi Oulare, standing at 6ft 5 ins, replaces Aboulay Diaby in attack. Time for a more direct approach perhaps. Quote Message: You can already sense Bastian Schweinsteiger's presence. He has come into the midfield and probably had more touches than anyone in the second half. He is always available and I think he will be good for Morgan Schneiderlin. You can already sense Bastian Schweinsteiger's presence. He has come into the midfield and probably had more touches than anyone in the second half. He is always available and I think he will be good for Morgan Schneiderlin. A strong break from Morgan Schneiderlin. The midfielder dives into Brugge's half and sets Wayne Rooney through down the left. Rooney runs down a blind alley. Seconds later, Memphis picks the ball up and again runs at a terrified Brugge defence. His low shot is palmed away by goalkeeper Sebastien Bruzzese. A dominant first-half display from Manchester United with 64% possession and seven attempts on goal compared to Club Brugge's one. Change at half time for Manchester United in the centre of midfield. Michael Carrick is replaced by Bastian Schweinsteiger. The second half is underway. Elsewhere in the Champions League, it hasn't been a thrill a minute. Sporting Lisbon are drawing 1-1 with CSKA Moscow, while earlier Kazakhstan side FC Astana beat Cyprus' Apoel Nicosia 1-0. Quote Message: It's been an entertaining game. Club Brugge started brightly as they knew the type of pace that English football is played at, but then Memphis gets two goals to put United into the lead. You have to expect more goals from United as Brugge are feeling the pace. It's been an entertaining game. Club Brugge started brightly as they knew the type of pace that English football is played at, but then Memphis gets two goals to put United into the lead. You have to expect more goals from United as Brugge are feeling the pace. A horrible start for Manchester United and Michael Carrick in particular but they have recovered and look in total control. They could do with a few more goals to make the second leg in Belgium a lot more comfortable. Here come Manchester United again. Wayne Rooney rampages down the right but, after beating his man, to get to the bye line his low cross can only be stabbed wide by Adnan Januzaj. Quote Message: It was just a wonderful goal by Memphis. It's wonderful ball and wonderful run in behind the full back. He used the defender as a guide and didn't blast it but still got plenty of pace. You don't save them. You have got to say Brugge are feeling the pace. It was just a wonderful goal by Memphis. It's wonderful ball and wonderful run in behind the full back. He used the defender as a guide and didn't blast it but still got plenty of pace. You don't save them. You have got to say Brugge are feeling the pace. Take a bow son. That is brilliant. Daley Blind slides the ball into Memphis' feet on the left. He cuts inside and, from the edge of the penalty area, he curls the ball into the far corner with his right foot. Memphis is having a stormer. A blow for the visitors as the experienced Timmy Simons, a holding midfielder, limps off with a thigh strain and is replaced by Brazilian Claudemir. He will fill in just in front of the back four. Memphis is at the centre of everything good about Manchester United at the moment. This time he sends in a speculative shot from 20 yards and goalkeeper Sebastien Bruzzese parries the ball away. Manchester United could rue these missed opportunities. Some more nice movement in the midfield and the ever-dangerous Memphis runs clear on goal down the right. He could go for goal but he opts to cross for Adnan Janujaz and he is off radar. What a din the away fans are making. They are determined to enjoy thernselves this evening. Quote Message: I still think Michael Carrick and Morgan Schneiderlin want to do the same job and that's why I think Brugge have exposed Manchester United a little bit. They are supposed to be protecting the back four but they are not. I still think Michael Carrick and Morgan Schneiderlin want to do the same job and that's why I think Brugge have exposed Manchester United a little bit. They are supposed to be protecting the back four but they are not. Tuur Dierckx flashes in a low cross from the right for Brugge but none of his teammates are up with play and the ball is cleared. United look tidy going forward but there are gaps galore defensively. Harry Partridge: If United fail to qualify, could they afford to keep De Gea if that meant losing him on a free at the end of the season? Another chance gone for Manchester United. Juan Mata slips the ball in behind Brugge's defence and Adnan Januzaj latches on it. He is crowded out though and as he slides in to try and beat goalkeeper Sebastien Bruzzese to the ball, he is penalised. Acrobatic stuff from Wayne Rooney but his volley is hacked clear. From the resulting corner, the England striker rises unmarked but can only glance the ball wide. Should do better, much better. Quote Message: Brugge have just dropped back and are not pressing as high up the pitch as earlier which is good news for Manchester United, who still need to be wary of the counter-attack. Brugge have just dropped back and are not pressing as high up the pitch as earlier which is good news for Manchester United, who still need to be wary of the counter-attack. Brugge look dangerous though as Ruud Vormer races clear down the right. The winger has acres of space but, with two players waiting, he hesitates and his cross is blocked. From the resulting corner, Dion Cools' volley is straight at goalkeeper Sergio Romero. Here comes Memphis again. He drives through the midfield before spraying a pin-point low pass to the feet of Juan Mata inside the penalty area. That is where the quality ends though as his wasteful chip flies through the penalty area and away. Michael Carrick's own goal was the first Champions League qualifying goal United have ever conceded at home. They will be a lot happier now though. Corner to Manchester United. Memphis swings the ball in, Juan Mata sees a shot blocked and Brugge clear the danger. The hosts are well on top. Quote Message: Memphis cuts inside and scores and we will see that a lot. Brugge will start to feel the pace but they look a threat on the counter-attack. Memphis cuts inside and scores and we will see that a lot. Brugge will start to feel the pace but they look a threat on the counter-attack. Maybe Brugge's struggles in England will continue after all. Michael Carrick makes up for his own goal as he slips a pass into Memphis on the edge of the penalty area. The Dutchman juggles with the ball, before cutting inside and firing the ball low into the net. Great finish. His first United goal. Time for things to change? The visiting Brugge fans have gone absolutely crazy. They launch into a rendition of "are you watching Anderlecht". Quote Message: Michael Carrick slips really. I still can't work out how he goes to ground as he seems to get his feet muddled up. Manchester United keeper Sergio Romero had taken a step to his left and couldn't get back. The game is like a cup tie as it is very open with United leaving gaps all over the place. Michael Carrick slips really. I still can't work out how he goes to ground as he seems to get his feet muddled up. Manchester United keeper Sergio Romero had taken a step to his left and couldn't get back. The game is like a cup tie as it is very open with United leaving gaps all over the place. Now that wasn't in the script. Victor Vazquez stands over a free-kick some 40 yards out from goal and swings a harmless-looking low cross into the box. Michael Carrick, the first man in a crowded penalty area, lunges towards the ball and prods the ball into his own net from about 16 yards. Quote Message: It's a good start to the game, end-to-end. I don't think it was a penalty as Abdoulay Diaby looked like he fell down. Januzaj has started the game very well. He is a talent. He has got so much ability and I think down the middle is his best position. It's a good start to the game, end-to-end. I don't think it was a penalty as Abdoulay Diaby looked like he fell down. Januzaj has started the game very well. He is a talent. He has got so much ability and I think down the middle is his best position. A very open start to the match. United are playing some neat early stuff, although Adnan Januzaj will want to forget that. Step over, step over, sees him beat his man on the left but, about to cross, he appears to slip and kicks the ball straight out. Brugge hit back as Abdoulay Diaby goes down in the penalty area under Chris Smalling's challenge. Never a penalty and it isn't. Almost the perfect start for the hosts. Juan Mata's pass sends Adnan Januzaj down the right and his low cross is inches away from being turned home by a lunging Wayne Rooney. Here we go, Champions League football - well almost - is back at Old Trafford. The teams are on their way out, but not before Louis van Gaal whispers in Wayne Rooney's ear... 'You'd better score tonight Wayne'. So here we do, all together now. Du du du, du du du du. - that is the Champions League music by the way. There is a real atmosphere building at Old Trafford - the sort of atmosphere that only a midweek Champions League match can generate. In 1976, the Reds beat the Belgians 4-3 over two legs to lift the Uefa Cup and then, two years later, Kenny Dalglish's goal at Wembley defeated Brugge in the European Cup final. Tom Oakley : Jose Mourinho has to push for champions league with the ability in the squad. Mo Hassan: Real Madrid part of the dominant group in the last 10 years of Champions League with only one final? Man Utd have been in three. Ross : Bayern at full strength. I think even Barcelona might struggle to compete with that. Eight of the last Champions League finals have involved Bayern Munich, Real Madrid or Barcelona. Who could challenge their dominance? Get involved using #bbcfootball, text us on 81111 or post a comment on the Match of the Day Facebook page. Quote Message: When I returned to my office from the training pitch after the draw I received a text message from Marouane which said: 'Good luck.' I immediately replied with: 'You too, haha.' I always had a good bond with him. After all, he is one of my lads. When I returned to my office from the training pitch after the draw I received a text message from Marouane which said: 'Good luck.' I immediately replied with: 'You too, haha.' I always had a good bond with him. After all, he is one of my lads. Manchester United boss Louis van Gaal on BT Sport: "There is a lot of pressure for us but we have to cope with it. "We need experience and we can't lose the ball unnecessarily. In the last two matches we are too easily losing the ball." What does the future have in store for United goalkeeper David De Gea? The Spaniard is yet to play this season with manager Louis van Gaal refusing to pick the 24-year-old, who has been strongly linked with a move to Real Madrid, until after the transfer deadline. But De Gea took part in training ahead of Tuesday's clash with Club Brugge along with current No.1 Sergio Romero, Sam Johnstone and Anders Lindegaard. He doesn't feature again though. It has been reported that chief executive Ed Woodward has travelled to Barcelona to complete the £22m transfer for midfielder Pedro. Manchester United boss Louis Van Gaal identified playmaker Victor Vazquez as a dangerman for Club Brugge and the Spaniard starts for the Belgian side, who have had their injury problems heading into the game. Club Brugge: XI: Bruzzese, Duarte, De Bock, Mechele, Cools, Bolingoli Mbombo, Simons, Vazquez, Vormer, Diaby, Dierckx. John McEnerney: On their best night Atletico Madrid could challenge those three but they haven't reproduced the form that won them La Liga. All others no chance. Steve Neary:Manchester City. The Blues are creating a squad capable of winning the Champions League. Pace and skill across the field. What time is it Bastian? It seems as though Bastian Schweinsteiger is getting used to the English 'banter' pretty quickly, as shown by this quote in an interview with German newspaper Bild. "I eat sauerkraut although I don’t love it, but I can smile about it… It’s as they call the Germans for fun here. The English have a special sense of humour. This I immediately experienced in the dressing room. As I walked with two plates while eating, suddenly a teammate asked me ‘Basti, what time is it?’ – Hoping I would automatically turn my hand to look at my watch. That’s quite entertaining." They are yet to win in 11 games in England - losing nine - and are also winless in six matches against English teams since a 1-0 first-leg success over Chelsea in the 1994/95 UEFA Cup Winners' quarter-finals. Make no mistake a win for the Belgians over two legs would be one of the all-time European shocks. Our BBC Radio 5 live pundits are talking about those sides that could rival Barcelona, Bayern Munich and Real Madrid in the Champions League. European football expert Andy Brassell says: "I think Paris St-Germain can do very well. Angel Di Maria, although it did not work out for him at Manchester United, will be a game-changer for PSG." Don't forget you can listen to the commentary online on this page. Patrick Purtill: Maybe Man City if their early season form is anything to go by plus more players to come in - think they will do much better this season. Logan Clifford: Chelsea are the team that's in prime position to do that but how their form is looking I don't think they'll do it this year. Man Utd won't get past the semi-finals. Man City will flop in the group stage (depending who they get). Arsenal I hope will go far but I can't see more than QF or SF. Joey Cunningham-Lennox: Not this year. Nobody looks like they have a strong enough team. "Brugge will be organised, but they will sit back and try to get away with not conceding many goals and then maybe at home they will see if they can get a result. "I saw them play last week and they're a very slow side, very open and I can't see them troubling Manchester United. They will come here and say 'close ranks'. "The United board have given Louis van Gaal a lot of money to play with so they believe in him but I think they're still short of a centre forward and a good centre-half." "Manchester United think they were £35m worse off by not getting into the Champions League last season." Manchester United as boss Louis Van Gaal sticks with the same starting line-up which beat Aston Villa in the Premier League last Friday. Striker Wayne Rooney gets the chance to spearhead the attack, despite his indifferent form so far this season. Adnan Januzaj scored the winner at Villa and keeps his place. Man Utd XI: Romero, Darmian, Smalling, Blind, Shaw, Carrick, Schneiderlin, Mata, Januzaj, Depay, Rooney. The team news is in from Old Trafford and it as you were for Manchester United. Louis van Gaal names the same side as the one that beat Aston Villa on Friday night.Full line-ups to follow. Double booked your evening? Can't get near a radio for tonight's match? Don't worry you can listen to live commentary on your phone, tablet or any other platform online. For the first time, BBC Radio 5 live has the rights to stream Manchester United's European commentaries online this season - giving you the perfect solution if are out and about this evening. You can follow live text of the match here and, by clicking on the audio icon above, you will also have access to live commentary. Job done. Here are all tonight's fixtures - courtesy of the Champions League's Twitter feed. On that subject you can also vote on who is most likely to challenge Barcelona & Real Madrid in the Champions League. The vote will run until 21:45 BST and we will publish the results soon after. Let us know who you think could break that monopoly and why by tweeting #bbcfootball, text 81111 and posting on BBC Sport Facebook. You can listen to commentary on BBC Radio 5 live from 18:30 this evening, with all the build-up, debate and analysis from Old Trafford. For the first time, BBC Radio 5 live have the rights to stream United's Euiropean commentary online and you can listen by clicking on the audio icon above. Yes, he may have guided United to two wins out of two in the Premier League this season, but this matters. Manchester United boss Louis van Gaal says the "pressure is high" at Old Trafford. Van Gaal, who took charge in May 2014, is looking to guide United to a return to Europe's elite club competition for the first time since 2013-14. "You cannot say it is not any pressure because they are a good team," he said. "We have to show our quality." Victory over two legs against last season's pro-league runners up would earn United almost £9m. Once there, they would receive £710,000 for every win and £360,000 for every draw. The prize money just grows and grows from there and, missing out on any of the gravy train, is just simply unthinkable. There is no wonder a certain Dutchman is feeling the pressure. Hello and welcome to a live text commentary of a match many Manchester United fans would not have envisaged being involved in just a few seasons ago. A Champions League play-off against Belgian side Club Brugge to reach the lucrative group stages. The Red Devils have splashed the cash this summer and you can guarantee European failure will not be in their financial plans. That is a conservative estimate of what Champions League glory could be worth to an English club this season.